Innovative 3-D designs from an MIT team can more than double the solar power generated from a given area. Intensive research around the world has focused on improving the performance of solar photovoltaic cells and bringing down their cost. But very little attention has been paid to the best ways of arranging those cells, which are typically placed flat on a rooftop or other surface, or sometimes attached to motorized structures that keep the cells pointed toward the sun as it crosses the sky. 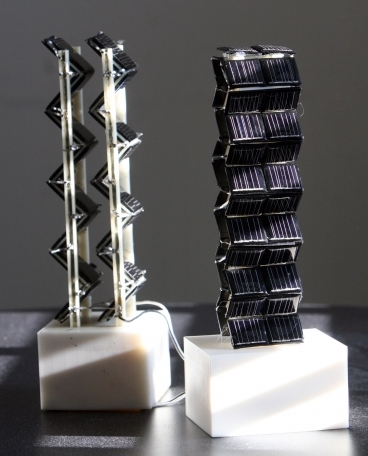 Now, a team of MIT researchers has come up with a very different approach: building cubes or towers that extend the solar cells upward in three-dimensional configurations. Amazingly, the results from the structures they’ve tested show power output ranging from double to more than 20 times that of fixed flat panels with the same base area. The biggest boosts in power were seen in the situations where improvements are most needed: in locations far from the equator, in winter months and on cloudier days. The new findings, based on both computer modeling and outdoor testing of real modules, have been published in the journal Energy and Environmental Science. “I think this concept could become an important part of the future of photovoltaics,” says the paper’s senior author, Jeffrey Grossman, the Carl Richard Soderberg Career Development Associate Professor of Power Engineering at MIT. The MIT team initially used a computer algorithm to explore an enormous variety of possible configurations, and developed analytic software that can test any given configuration under a whole range of latitudes, seasons and weather. Then, to confirm their model’s predictions, they built and tested three different arrangements of solar cells on the roof of an MIT laboratory building for several weeks. While the cost of a given amount of energy generated by such 3-D modules exceeds that of ordinary flat panels, the expense is partially balanced by a much higher energy output for a given footprint, as well as much more uniform power output over the course of a day, over the seasons of the year, and in the face of blockage from clouds or shadows. These improvements make power output more predictable and uniform, which could make integration with the power grid easier than with conventional systems, the authors say. The basic physical reason for the improvement in power output — and for the more uniform output over time — is that the 3-D structures’ vertical surfaces can collect much more sunlight during mornings, evenings and winters, when the sun is closer to the horizon, says co-author Marco Bernardi, a graduate student in MIT’s Department of Materials Science and Engineering (DMSE). The time is ripe for such an innovation, Grossman adds, because solar cells have become less expensive than accompanying support structures, wiring and installation. As the cost of the cells themselves continues to decline more quickly than these other costs, they say, the advantages of 3-D systems will grow accordingly. “Even 10 years ago, this idea wouldn’t have been economically justified because the modules cost so much,” Grossman says. But now, he adds, “the cost for silicon cells is a fraction of the total cost, a trend that will continue downward in the near future.” Currently, up to 65 percent of the cost of photovoltaic (PV) energy is associated with installation, permission for use of land and other components besides the cells themselves. Although computer modeling by Grossman and his colleagues showed that the biggest advantage would come from complex shapes — such as a cube where each face is dimpled inward — these would be difficult to manufacture, says co-author Nicola Ferralis, a research scientist in DMSE. The algorithms can also be used to optimize and simplify shapes with little loss of energy. It turns out the difference in power output between such optimized shapes and a simpler cube is only about 10 to 15 percent — a difference that is dwarfed by the greatly improved performance of 3-D shapes in general, he says. 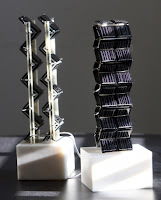 The team analyzed both simpler cubic and more complex accordion-like shapes in their rooftop experimental tests. At first, the researchers were distressed when almost two weeks went by without a clear, sunny day for their tests. But then, looking at the data, they realized they had learned important lessons from the cloudy days, which showed a huge improvement in power output over conventional flat panels. For an accordion-like tower — the tallest structure the team tested — the idea was to simulate a tower that “you could ship flat, and then could unfold at the site,” Grossman says. Such a tower could be installed in a parking lot to provide a charging station for electric vehicles, he says. So far, the team has modeled individual 3-D modules. A next step is to study a collection of such towers, accounting for the shadows that one tower would cast on others at different times of day. In general, 3-D shapes could have a big advantage in any location where space is limited, such as flat-rooftop installations or in urban environments, they say. Such shapes could also be used in larger-scale applications, such as solar farms, once shading effects between towers are carefully minimized. David Gracias, an associate professor of chemical and biomolecular engineering at Johns Hopkins University who was not involved in this research, says that Grossman and his team “have demonstrated theoretical and proof-of-concept evidence that 3-D photovoltaic elements could provide significant benefits in terms of capturing light at different angles. The challenge, however, is to mass produce these elements in a cost-effective manner.